Cable Wire Markers are used for cable and wire identification. It is beneficial for overall project efficiency and productivity, as well as critical to the safety of those involved by using proper cable wire marker identification. Fiber-Mart supply high quality cable wire markers but low price to help make your home and business safer both inside and out. They are ideal for your wire and cable marking applications. Our Cable Identification has color coded with numeric numbers on marker. This type cable wire marker is removable and reusable. 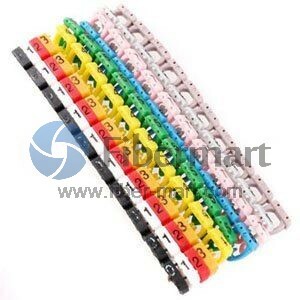 You can buy our cable identification and other cable manager such as Wire Loom, Cable Ties with confidence.